The Navy SEAL's controversial account of the Bin Laden raid goes on sale today. NBC's Danielle Leigh reports. Copies of a book by a former Navy SEAL titled "No Easy Day" are seen on display at a bookstore in Washington, D.C., on Tuesday. Updated at 9:33 p.m. ET: On the same day that a book about the raid that killed Osama bin Laden was officially released, the Commander of Naval Special Warfare Command sent a letter to all members of the Special Operations community warning them to stop releasing details about their secretive world. 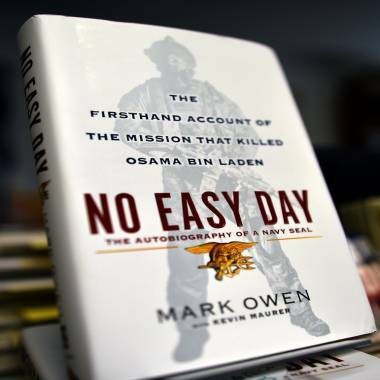 He was referring, in part, to “No Easy Day,” written under the pseudonym Mark Owen, which gives a firsthand account of the killing of the al-Qaida leader on May 2, 2011. The official said that a recent movie starring actual Navy SEALs and even the growing number of "SEAL" workout videos have all added up to too much information about the community out in the public arena. Over the next few weeks, Pybus will speak to senior leaders about how to stop the trend of former SEALS profiting from their time in uniform. Also Tuesday, Pentagon Press Secretary George Little said the book contains “sensitive and classified information,” although he refused to say what in the book is considered classified. The firsthand account of the Navy SEAL raid that killed Osama bin Laden has climbed to the top of the Amazon.com and Barnes & Noble.com best-seller lists. NBC's Brian Williams reports. Little said at this time the Pentagon would not attempt to halt the sale of the book on U.S. military installations. U.S. officials told NBC News the Pentagon appears powerless to stop the public distribution of the book. Little repeated the claim that by writing the book, the former Navy SEAL is in "material breach" of a non-disclosure agreement that requires him to submit the book or transcript to the U.S. military for prepublication review if it contains classified material. In a letter to the Pentagon's Chief Counsel, Jeh Johnson, the former SEAL's attorney claims his client was not required to put the book through the prepublication process. A senior Pentagon official, however, claims Owen violated his obligations on three counts. He failed to submit the book for pre-publication review, published classified information and revealed sensitive information about the SEAL's "tactics and techniques" in taking down bin Laden. Officials at the Pentagon say it's not clear the Justice Department will pursue criminal charges against Owen, but suggest the U.S. government could seize all money paid to the former SEAL and the publisher, Dutton, under the non-disclosure agreement signed by Owen before he left the Navy.